DRONES on farms are becoming more popular so it was not a surprise to see a few around Beef Australia this week. Much larger than the average run-of-the-mill drone is the DroneAgriculture, a heavy-lift octocopter drone with a lift capacity of 20kg that can apply granule herbicides in confined areas. DroneAgriculture is a joint venture between AeroBugs and Granular Products to provide a service where a chief pilot comes to the farm, flies the drone and sprays all of the infesting weeds. “We saw a need to treat smaller areas and harder to access areas and we teamed up,” Granular Products’ Paul Hubbard said. “A lot of farms may need to focus their attention on other aspects of the business and other hard tasks on a bit of a hill or really thick pieces of noxious weeds, where we can just take that pain away from them,” Mr Roy said. The services was thorough, the men said. “We have someone come out into the paddock, assess it for different areas and we map it up into polygons and we gave that to Nathan,” Mr Hubbard said. The drone has GPS point tracking and field-plotting technology which allows it to run along a pre-programmed track. Terrain following allows the drone to follow at the slope and depth of the ground while spraying through precision herbicide equipment. 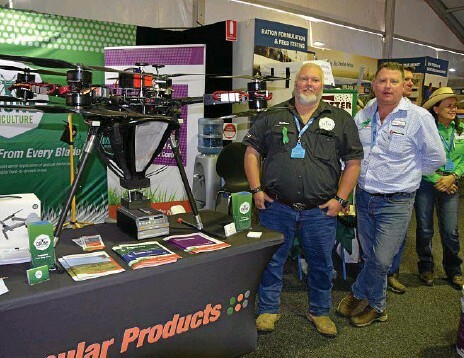 “There is a platform we use to map up a flight plan and then once it is uploaded into the drone, you enable the autoflight and the drone will actually fly those weigh-points and you can turn the spreader on and off to release the granules,” Mr Roy said. On a table in the RuralCo site, with long propellers and the tank in the middle, the drone has caught the eye of many passers-by. Drone work has mainly targeted giant rats tail grass along the eastern seaboard. Mr Hubbard said: “We have also had inquiries from people and the Meat and Livestock Australia looking to do work with the prickly acacia in western Queensland,” Mr Hubbard said. All pilots are trained and licensed with the Civil Aviation Safety Authority and have chemical accreditation.